An oil rig in a Fort Collins neighborhood (David O. Williams photo). 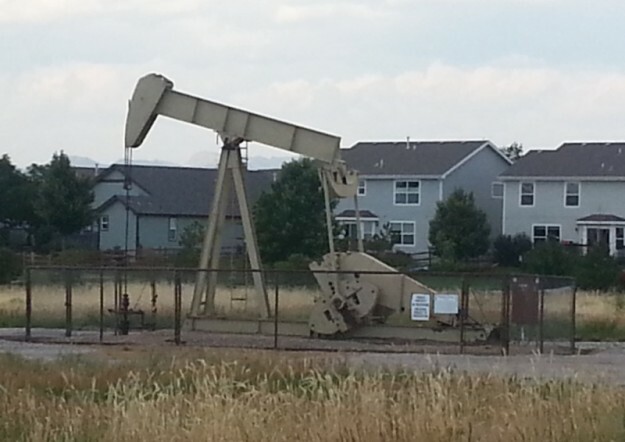 Following a lengthy outreach process, draft local-control rules for oil and gas drilling near homes and public buildings in Colorado’s towns and counties are “imminent,” according to Colorado Oil and Gas Conservation Commission Director Matt Lepore. The COGCC rulemaking stems from two recommendations made by Gov. John Hickenlooper’s Oil and Gas Task Force aimed at giving local governments more say in where and how oil and gas drilling occurs in their communities. Lepore recently told The Colorado Statesman the draft rules dealing with Recommendations 17 and 20 will be available for review soon, with the first of several stakeholder meetings on the rules scheduled for Nov.16 and a final set of rules delivered by Dec. 12. The process began when Hickenlooper struck an 11th-hour deal last year with U.S. Rep. Jared Polis, a Boulder Democrat who was financing two controversial ballot questions to shift oil and gas drilling regulatory control away from the state and the COGCC and give more power to local governments. That deal resulted in Polis pulling the ballot questions and included an executive order to form a 21-member task force of prominent Coloradans to come up with a set of recommendations to ease public concerns about the growing impacts of drilling in Colorado neighborhoods. Last month, the COGCC completed a series of 11 outreach meetings in Denver, Durango, Rifle, Broomfield, Brighton, Greeley and Fort Collins with representatives of 39 local jurisdictions. Twelve other organizations – four industry trade groups and eight environmental or citizen’s activist groups – also participated, although some activists walked out in protest. The biggest point of contention has been what constitutes a “large-scale oil and gas facility,” which the task force in Recommendation 17 wanted the COGCC to define and then require companies to work more closely on locating such facilities in urban areas. “If [a drilling operator is] putting it in an urban mitigation area, then there’s a requirement that they notify the local government where they’re placing the location well in advance of submitting the application to us, so that they have that opportunity for consultation about where the site is located,” Lepore said. Lepore said opinions have varied widely on that topic, with one elected official saying they thought a single well should be the trigger. Other local governments have argued they already work well with the industry to site drilling operations and don’t need more state regulations. Recommendation 20 asked the COGCC to come up with a process whereby operators register with municipalities well in advance of seeking state approvals in order to begin a long-term local planning process for siting oil and gas wells. There will be flexibility in the new rulemaking, Lepore said, which may actually come in the form of changes to existing state rules on the application or consulting process. Industry representatives say they already work well with many local governments across the state to minimize conflicts between mineral-rights holders and surface-rights landowners. “Our industry has a long history of working collaboratively with Colorado officials to support comprehensive and robust regulations covering oil and gas operations,” said Colorado Petroleum Council Executive Director Tracee Bentley. “So far, this cooperative approach has prevented unnecessary or unintentional roadblocks to the responsible energy production that is driving Colorado’s economic growth,” Bentley added, referring to citizen-driven efforts to ban hydraulic fracturing in several Colorado cities. Last month the Colorado Court of Appeals asked the Colorado Supreme Court to hear a pending lawsuit by the Colorado Oil and Gas Association seeking to overturn a voter-approved fracking ban in Longmont and a five-year moratorium on fracking in Fort Collins. Fracking, the process of injecting water, sand and chemicals under high pressure into oil and gas wells to free up more hydrocarbons, is now done in about 90 percent of wells. Karen Dike of Coloradans Against Fracking, an organization comprised of 40 citizens groups, predicts the new rules will do little to protect Colorado neighborhoods from the impacts of drilling. CAF, she says, wants to eliminate fracking entirely, and that may mean the groups have to put a question on the ballot in 2016.